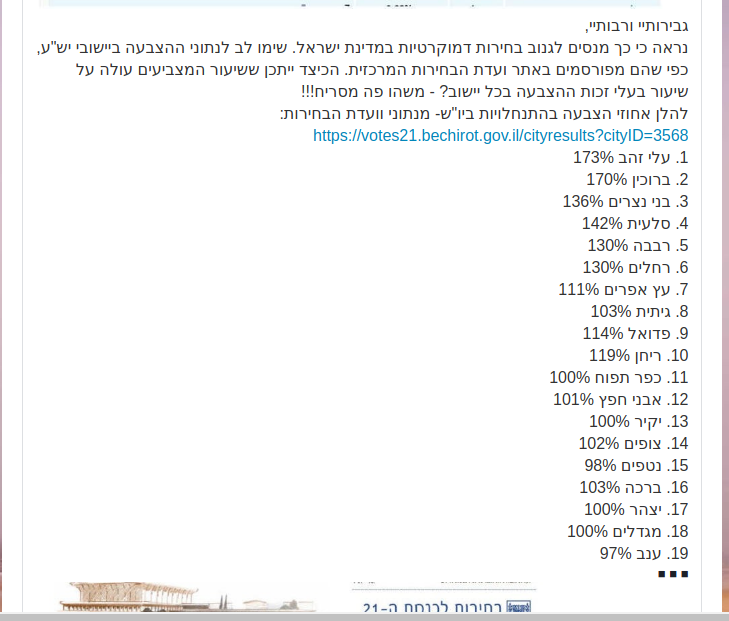 Israeli election outcome: hi-tech, start-up nation afflicted by "data entry errors"
Cyber warfare superpower, launching spacecraft to the moon, a day after the election the Israeli Central Election Committee published voter turnouts of over 100% in Jewish settlements in Palestine. 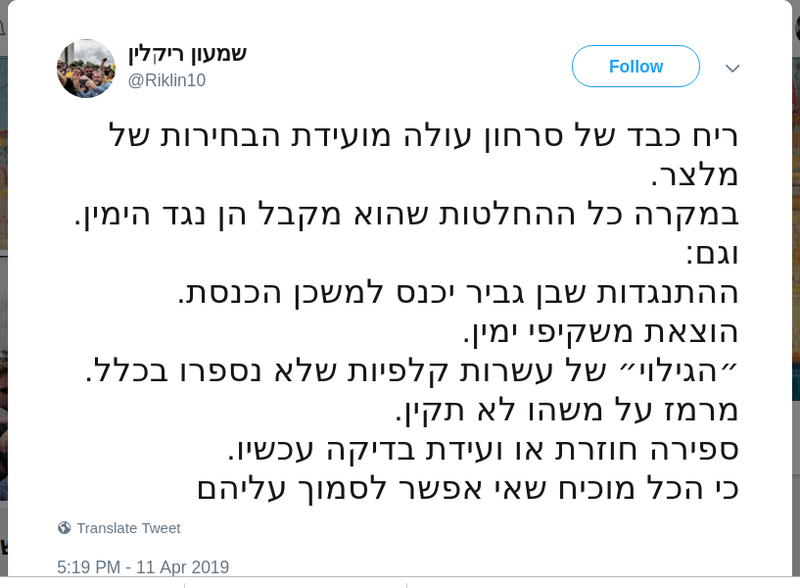 Keizler Inbar PR firm post, boasting the success of a secretive, "amazing logistic" operation, in collaboration with PM Netanyahu, in which cameras were illegally planted in Arab ballot stations, "preventing thousands of forgeries", and suppressing voting rates below 50%. [i] During the April 9, 2019 election, Police was called to stop the illegal videotaping. In contrast, a the morning after election day, activists posted the ballot station outcomes from the Central Election Committee web site, showing voter turnout in Jewish settlements in Palestine, ranging between 97 and 173% "
Activist post showing voter turnout in various Jewish settlements in Palestine summary of data, published on line by the Central Election Committee. 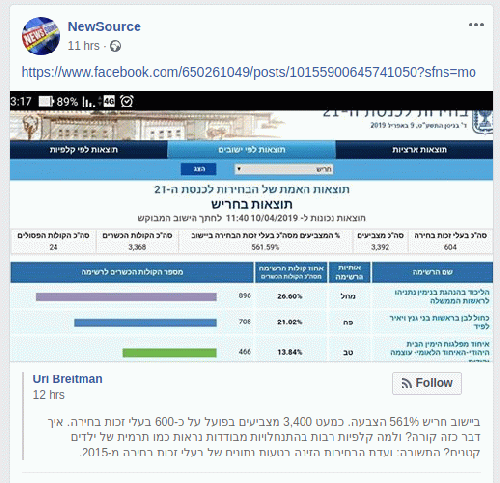 Activist post showing a screen print of data, published on line by the Central Election Committee web site, showing voter turnout in the Jewish settlement of Harish 561%. The Central Election Committee, headed by Supreme Court justices, has a checkered credibility record. 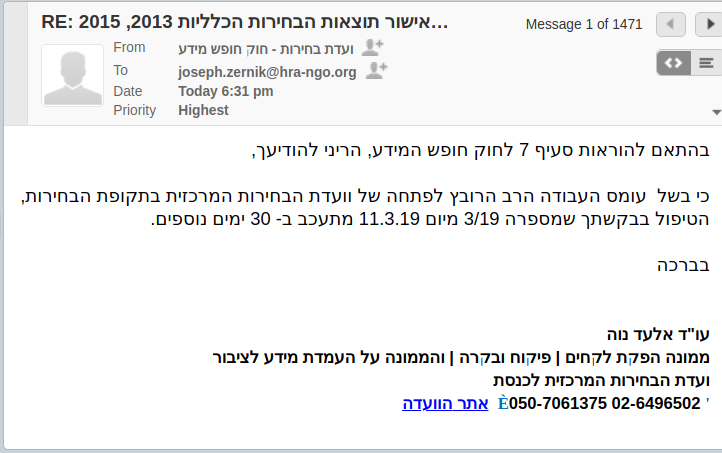 Human Rights Alert, and Israeli NGO, specializing in e-government monitoring and analysis has repeatedly documented failures in IT systems of the Central Election Committee, and lack of integrity in the Committee's Freedom of Information responses, pertaining to its IT systems. 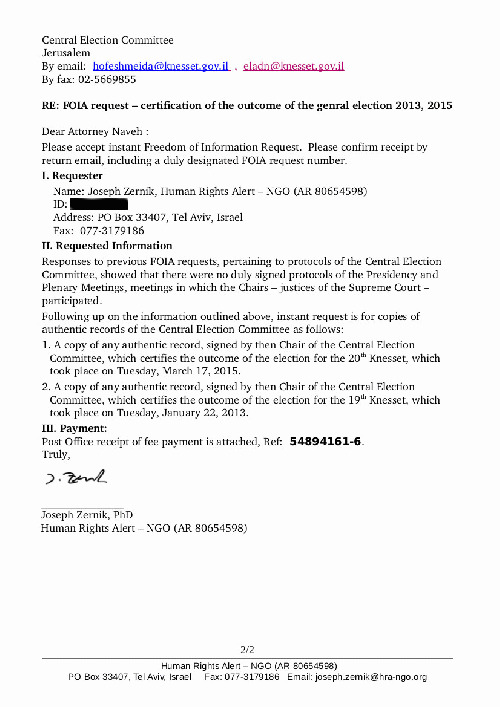 Top: March 11, 2019 FOIA request (03-2019), filed with the Central Election Committee by Human Rights Alert NGO, seeking documentation of certification of the 2013 and 2015 general election outcomes by Supreme Court Justice, who served as Committee Chairs. Bottom: April 08, 2019 (a day prior to the general election) note by the Committee, extending the lawful time for response by 30 days, due to "work overload". "Hot from the Committee, try to follow: There was an error. The total number of absenttee ballots was entered as 176,595, instead of approximately 236'000... Therefore, the number of 4,231,424 is incorrect. One should add to it 60,283..."
... 12 years of proven record running campaigns ... with Jewish settlers' committees... a secret campaign of planting Jews in Arab ballot stations across the country, in close cooperation with PM Netanyahu and Minister Yariv Levine..."
"An IT system fault perverted the display of the election outcome, but the counting of the ballots was correct. According to the Committee's press release, a secondary IT system caused erroneous data input of the absentee ballots, including the soldiers' votes. At the same time they clarified: "There is no error in counting the envelopes, only in data entry into the system"." 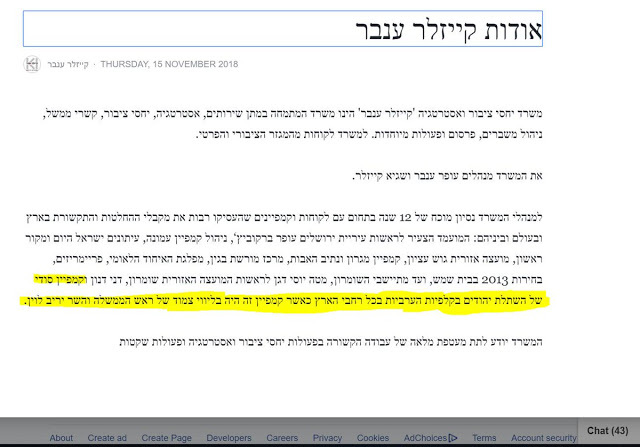 לפי הודעת הוועדה, מערכת מחשוב משנית גרמה להזנה שגויה של נתוני המעטפות הכפולות, בהם קולות החיילים. עם זאת הבהירו: "אין טעות בספירתן של המעטפות, רק בהזנתן למערכת"
Right wing journalist Shimon Riklin: Justice Melcer's Central Election Committee stinks to heaven... "Discovery" that dozens of ballot boxes have not been counted at all... Everything shows that they are not trustworthy. "Transparency of ballot counting must be transparent. It is the most important democratic process... It must be open to the public, broadcast live with online updates. There is one person, who is responsible for the current mess - Chairman of the Central Election Committee Justice Hanan Melcer. Employing security guards, closed doors counting of the ballots amount to contempt of democracy." "The fact that outcome of the election is determined by fights in the Committee, instead of, for example, orderly counting of the ballots, is simply shocking." 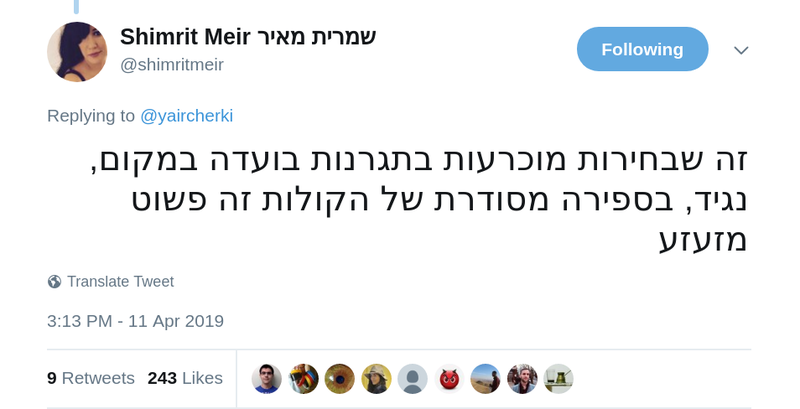 Haaretz daily runs this weekend an OpEd piece by attorney Uri Weiss, calling for the immediate resignation of Justice Hanan Melcer, Chair of the Central Election Committee. The reason: His failure to protect the Arab minority against blatant actions of voter suppression, expressly admitted as such, and in direct collusion of PM Netanyahu. 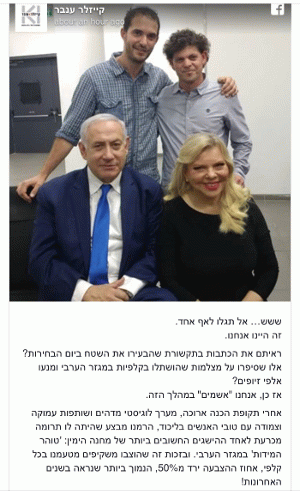 The piece includes the post by Kaizler Inbar with the photo of the partners with the Netanyahus, shown in this report as well, as key evidence. Weiss sees in the entire incident part of the legitimization of Apartheid by the Israeli courts. Some errors are better than others.